Jack Frost this morning but we have lovely sunshine. Not a good nights sleep indigestion and sinuses kicked in so rather a fragile lark this morning. Eldest Granddaughter and her husband came to visit us yesterday evening only stayed an hour and brought with them HL birthday presents for his birthday next week. We are off to visit daughter and son in law this afternoon for my birthday lunch, Patch loves going as he gets to spend time with daughters dogs. No frost here, Camilla. Sorry to hear about your disturbed night. I also had a disturbed night as it happens but today is not so bad. Enjoy the visit to your daughter's this afternoon. Terrible things these disturbed nights but it is sadly the lot of the senior middle-aged. Maybe we should form a campaign! I should add that I like that interior - not the most of the ones you've posted but near the top. 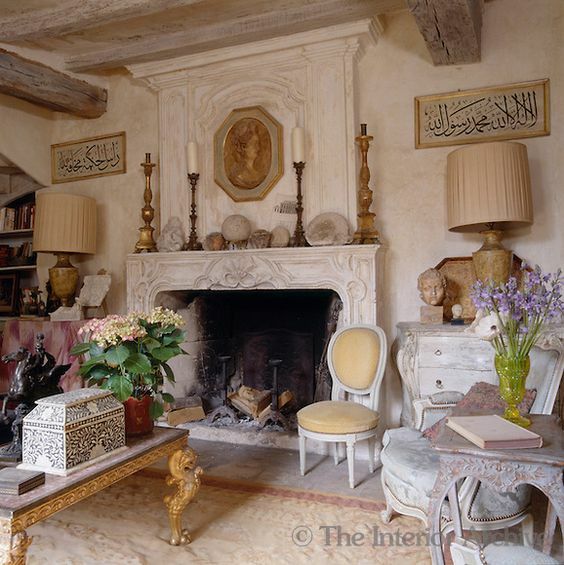 Particularly the beams and the calligraphy, less so the marble/plaster/alabaster - hard, cold surfaces. Could do with that nice fire going at the moment Fennie.